The Trek Collective: Toys, games and a chair? 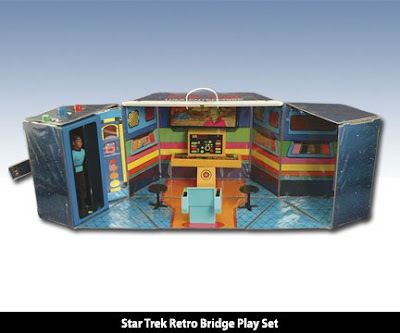 Diamond Select Toys have announced/confirmed they will be releasing a reproduction of the old Bridge Playset to compliment their line of retro cloth figures. Highlights from the original design include "working spin-around Transporter mechanism, fold-up design with carrying case handle, interchangeable view-screen graphics, do-it-yourself decal sticker sheets as well as plastic chair and table accessories! ", plus some new fangled features apparently! 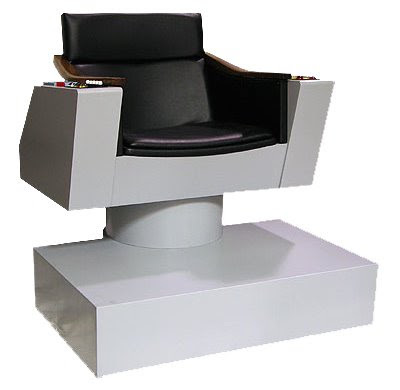 Meanwhile TrekMovie report (and later provide an image) DST are also planning bridge accessories on a larger scale, in the form of a life size replica of Kirk's command chair, complete with lights and sounds... Pike variant with a little viewscreen to follow? 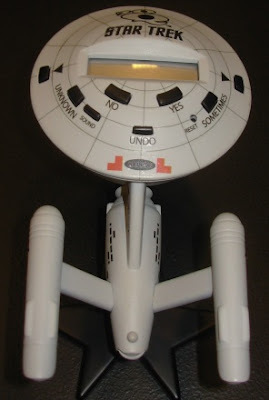 The saucer section is apparently the game bit, with the rest of the ship acting as a stand.